Secret Mysteries of America’s Beginnings unfolds the fascinating history behind the founding of America, and exposes the esoteric underbelly of its design. Why is Washington D.C. build on the 77th Meridian? Are the Revolutionary War cities really built in perfect alignment with Stonehenge? If America was founded as a Christian nation, why are many of its symbols based on Pagan traditions? There is no doubt that much of America’s national heritage was Christian, but just as a coin has two sides, our national heritage has a second side – one based squarely on occult secret societies and their values. To find the answer to these questions, we follow the journey of secret societies from England to the New World and learn of their ancient hope: to rebuild the lost empire of Atlantis. Where The DaVinci Code meets National Treasure: Learn the incredible secrets of the esoteric traditions, hidden within the manifold layers of signs and symbols in our nation’s infrastructure. 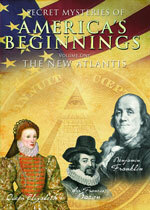 Find out why some believe that from ancient times America has been chosen to fulfill a secret destiny. Home | Contact Us | Cart | © 2006 Adullam Films. All rights reserved.